XL is set to be the biggest club event Melbourne has ever seen! 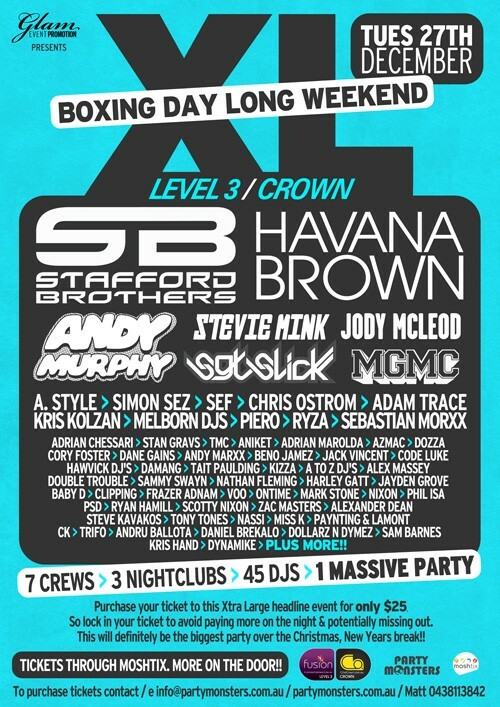 Tuesday December 27, 2011, Boxing Day Long Weekend, the entire level 3 of the Crown Casino Complex. A-Style, Simon Sez, Chris Ostrom, Kris Kolzan, Piero, Melborn DJs, Adam Trace and Sebastian Morxx. not have the outrageous price attached to it as most others of it's stature would. All details on how to purchae tickets are on the flier in the photos section! This will surely be Xtra Large!